Dubai will play host to the International Autumn Trade Fair (IATF) 2015 from 16-18 December 2015 at Dubai International Convention & Exhibition Centre. Organisers said that UAE per capita trade reached USD 69,704 between 2011-2013, according to the ‘Trade Profiles’ report published by World Trade Organisation (WTO). The same report added that UAE merchandise exports crossed AED 1392 billion (USD 379 billion) in 2013, while imports reached AED 922 billion (USD 251 billion) in the same period. These statistics were highlighted on the announcement of IATF15. The exhibition in its 30th edition will attract over 200 companies from 13 nations of the world. IATF15 will put on display an array of products in kitchenware, tableware, bath-ware, glassware, home appliances, home d?cor & home textile, fashion and fashion accessories, light and electrical, travel goods. sports goods art, antiques & handicrafts, auto parts, building materials. 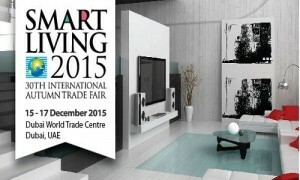 carpets & wall coverings, cosmetics, perfumes & beauty aids, electronics & electrical, furniture, gifts & novelties, plus many more.